Why hello there. Vote to see the next page early! EDIT - oops, forgot to change the incentive last night. Fixed! What was that about First Contact? Feces. Meet fan. So I don't know who you are, mysterious Redditor person, but please oh please continue to link my comic on that there site. I <3 you very much. Word of mouth is WAY better than paid advertising online, and I really appreciate anyone who links me on forums, on their blogs, tumblr, shares posts on FB...you guys are really great. 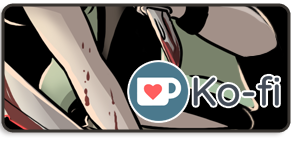 I'm going to keep pimping that Patreon over there in the sidebar for the time being. Only $28 $25 until the next tier is reached and the second extra update is locked in (remember to come back September 1st for a monday update). THANK YOU ANDY for increasing your pledge! <3 But I also wanted to explain something for those of you who may be put off by the tier placements. I started this with 4 carefully considered tiers--$20 for no ads, $50 for an extra page, $100 for a second extra page, and $250 for an extra monthly story. The first goal was a test to see if there would be support, deliberately set pretty low. You guys rocked that one, and I was ever so happy to get rid of ads. But to some readers, I'm sure it seems like A LOT to ask for that much ($50 and $100) for extra pages. But I'm not asking for $100 to make a page. On average, I do 8-9 pages of What it Takes per month. Add in an extra page to make an even 10. My patreon isn't set up to pay for extra work--it's made to help pay for the USUAL. So am I asking $50/page? NO. More like $5 for TEN pages put up each month. $100 for 2 extra page? NO. $10 for each update. 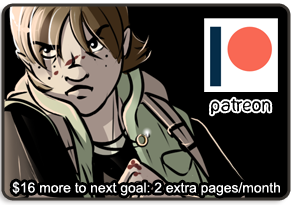 My goal for this Patreon is to reach $200 per month, or $20/page. I think that's fair. Not even minimum wage (takes me 3 hours/page), but hey, I'd take it to do something I already love doing. So even if you don't support my patreon, remember that for OTHERS' Patreons, the creators may be offering extra perks and stuff, but the goal? It's to get paid for the stuff they are ALREADY doing. You're supporting the person/team more than just the product in a lot of cases. Today's PSA is brought to you by "Kez is out of chocolate."